In the Home of Susan Jones Kenyon – Meredith Sell: Editor. Writer. Thinker. This is another piece I wrote for my current internship with the Smithy Center for the Arts. Walking into Susan Jones Kenyon’s house is the closest you can get to entering the artist’s mind. 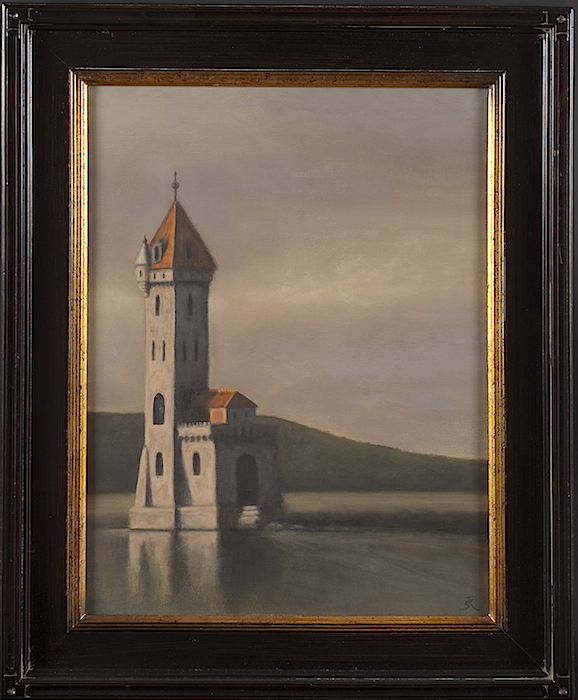 As soon as you set foot through the side door, you’re surrounded by Susan’s art: paintings of Otsego Lake and Kingfisher Tower, portraits of her three children, pots featuring angels and fairies, and dog bowls—yes, dog bowls—that Susan painted while working for Bradley Goodyear Smith as a designer. Take a few more steps and you’ll enter the Kenyon living room, adjacent to Susan’s studio on the southwest corner of the house. The walls are light brown and nearly covered with Susan’s oil paintings. If you’re lucky, you’ll arrive when Susan, 54, is on the phone with a frame company—allowing you a few extra moments to look around, soak up the art she surrounds herself with, and study the canvas painting she’s sending to the Cooperstown Art Association’s national show before you ask the self-taught artist when she started painting and find out . . .
Susan: I’ve painted ever since I was a child. The story is that my mother allowed me to paint on my walls. That’s really where it started, where I could create. From there, it wasn’t until the last of my three children was born that I seriously started to paint. That’s when I started with portraits. From there, it went to folk art . . . and from there, Bradley Goodyear Smith hired me as a designer to do dog dishes. I did that for four years . . . and then I started wanting to create my own art, get my own style. What is the art in me? What would I paint on my own? SCA: You describe yourself as a self-taught artist. Can you expand on that? Susan: Being self-taught, there are no rules. That’s the great thing. When I look at the masters’ paintings or even other artists, local or whatever, I like to look at how they use their brush strokes, their interpretation of paint. I’m a very visual person—I’ll forget names and things, but I’ll remember visually little, minute things. For instance, if somebody says, “I live on Route whatever,” I’ll say, “Well, what color is your house? Do you have a mailbox? What color is that? Do you have a garden? What flowers are in it?” Everything’s very visual to me. I believe I have a gift of seeing color within color. When I look at something, I don’t just see a flat color. When I’ve painted portraits of people, I see many colors within their face. I can look at your face and I can predominantly see one color with you, which is a light pink, but then you have gold and you have some blue. I see all these colors, and so instead of just seeing you—“Okay, she’s a peachy color”—there are all of these other colors. That’s how I paint. It’s very intuitive. I just pick up a brush and I’ll have a blank canvas out, and I’ll pick up a color and I’ll start to work. SCA: So you don’t go with a plan. Because a painting for me is to emulate a feeling, an emotion. You want to capture the spirit of that person. It’s not a photograph. If you want a photograph, then you need a photographer. If you want a painting, you want the painting to emit an emotion, a feeling about that person, or whatever you’re painting. My paintings, I always want people to look at them and then say, “I want to go there,” or “I want to walk into that painting and just be part of it.” I’d like people to feel a sense of peace and calm. SCA: You said your mother allowed you to paint on your walls. Was she an artist? Susan: No. My mother was a stay-at-home mom and she had health issues her whole life from the time I was little. The irony now is I’m the age she actually passed on, and I have a show at the Fenimore [Art Museum]. SCA: You started painting seriously when your youngest was born and now she’s 17 years old. What was the in-between and what got you to start painting seriously? Susan: There were a lot of things. My mother when she passed on, there were a lot of emotional things. Things that I went through in my personal life where I always found painting to be a release of emotion . . . I needed a release and something opened up where [painting] presented itself to me again. Even though I had two other small children and then Elle was born. It was there. So I’m going to paint. SCA: Do you have advice for aspiring artists? Susan: The main thing is to not be afraid. And never say, “I’ve got to create something and it has to be a finished piece.” You can’t gain any ground or do anything unless you start. You have to get your hands dirty in order to make it happen. I also believe there is no failure, because everything, you can learn from, so all you’re going to do is gain more wisdom, and it’ll just take you to another place. Think outside the box, because that’s where a lot of wonderful things in the world have happened—because people have not been afraid, they’ve thought differently, they’ve questioned things. SCA: Was there a certain point in your art-making where you had to start thinking outside of the box? Sarah: Times when I wondered, “Why am I doing this? What is the point? Am I really helping anybody?” I’ve learned it’s not always about feeding the physical body, but it’s about feeding the soul and spirit. That’s where I believe the arts—people need that. They need music, they need dance, they need theatre, they need paintings and sculpture and all that, because that’s the expression of the soul. You have to nurture that just like you have to nurture your physical self. SCA: Tell us about your studio. Susan: It was the family room when we moved here. The whole house has been evolving constantly—I’m into that too, where nothing is the same all the time. The whole house is a creative palette. That became a studio space because I gravitated toward the light in there. I don’t paint in any certain light. I usually paint at very odd times. I’ll work on a painting, and then I’ll leave it, and I’ll have other paintings going on. This has become the creative room in the house, which I found out—this house is from 1862—there was a piano teacher who taught piano in there. And downstairs—this was a boarding house for a while—there was a guy who was a photographer. He was taller and our basement’s really short, so down below this room, he dug out the floor so he could stand and develop his photographs. And my middle child, the older daughter, she’s an artist—her room was right up there [above the studio]. She painted some characters on her walls that are still there. And my husband is into music—he plays piano and he has guitars—he’s in that room now with his guitars. So this is the art corner of the house. SCA: Why did you decide to show your piece, “Sanctuary”, in the Smithy’s current show? Susan: I think because it was probably the most representative of my work at this point in time. I didn’t want to put a lot in, because I’m curating the show and I wanted it to be about the other artists. I didn’t want it to be about me. SCA: How is “Sanctuary” representative of your work? Susan: I think the feeling. Right away people who know me can look at it and say, “Susan did that.” And the title alone—“Sanctuary”—is restful. NOTE: The exhibition at the Smithy-Pioneer Gallery at 55 Pioneer St., Cooperstown, NY, has since changed. Learn more about Susan Jones Kenyon here. Next ›Brief sparks of fireworks.